I had bought a packet of four leeks (on offer at Lidl). I’d used the green ends to make ham and split pea soup and the remains of the other two to make Macaroni cheese with leeks. So I used the rest to make this tart. Heat the butter in a large saucepan. Stir in the leeks. Cover, and cook very gently for 10 minutes. Then allow to cool. Meanwhile, grill the bacon until it starts to crisp. Remove from grill, allow to cool a little, and cut into thin slices. Beat the cream and the eggs together and stir in the cheese. Add the bacon and leeks, stirring well. Add nutmeg and black pepper according to taste. Add the mixture to the pastry case, and cook at 160C (Gas Mark 4) for about 40 minutes, or until well browned and firm on the surface. 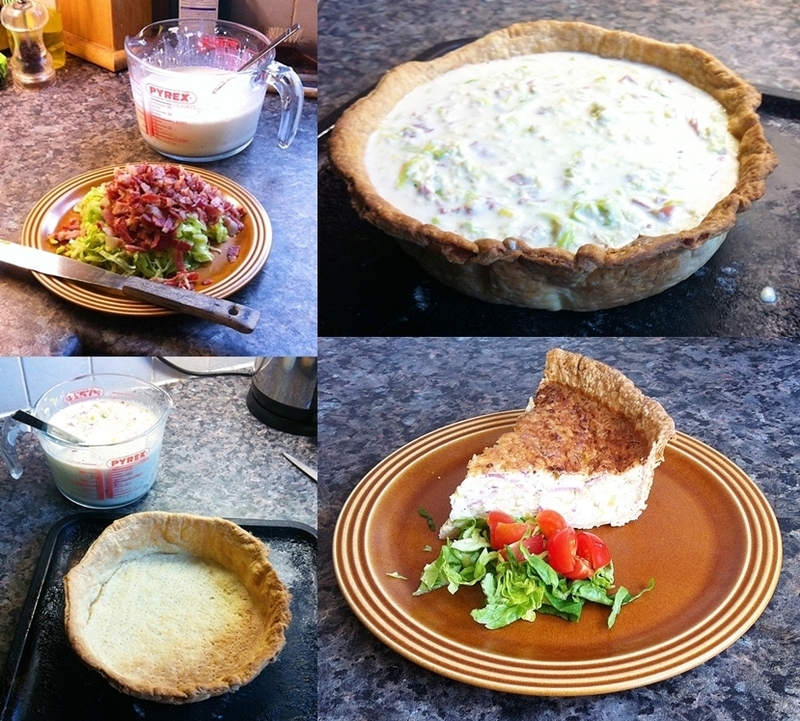 This entry was posted in Baking and tagged bacon, cheddar, double cream, eggs, Leek bacon and cheese tart, leeks, pastry case, quiche, tart. Bookmark the permalink.